Iron Man 2 is old news now; heh - just waiting for the Blu-ray then I'll get all excited again but for now let us turn our attention to one of Marvel's teir-one superheroes, Captain America. Director Joe Johnston (The Rocketeer, The Wolfman) is head honcho for the movie based on Steve Rogers, a young soldier during WWII who volunteers to undergo a series of experiments for a US army Super Soldier program which transforms him into a human weapon: Captain America. In order to defeat a high ranking Nazi menace, The Red Skull; Cap sacrafices himself and becomes entombed in solid ice for 60 years... ...until now. Well that's just probably the most feasable"origin story" they could possibly glean from a rich history almost as old as Batman and Superman, I'm sure it'll be something like that. So Johnston will direct pretty-boy Chris Street Kings Evans in the role of the Captain [thankfully ending fourther Fantastic Four embarassment] and it was announced Tuesday that Hugo Am-I-seriously-being-typecast -or-what? 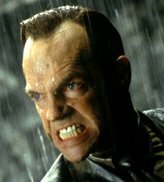 Weaving will portray The Red Skull in yet another role akin to V for Vendetta and Transformers where we'll not see the man's awesome facial expressions. Captain America: The First Avenger is slated for a July 22nd 2011 release [only a few weeks after Kenneth Branagh directs Chris Hemsworth in Thor]. 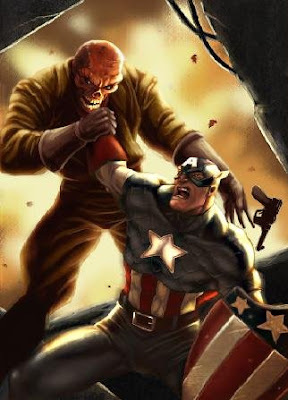 Captain America will probaby feature a far heavier link to Joss Whedon's The Avengers movie in 2012. More when I have it. This is indeed a tragic day, Who amongst us will now Flame On?